The Oribe Gold Lust Collection is the reparative hair holiday pack. This Oribe set is perfect for our ‘Gold Lust lovers’ and someone who feels they have damaged hair. The Gold Lust package comes with Oribe’s Gold Lust Repair & Restore Shampoo and Conditioner, along with Gold Lust Nourishing Hair Oil. The pursuit of healthy hair can be aided by restorative properties within the Gold Lust Collection. Bring life back to your hair, maintain your color, and keep your hair healthy. Are you constantly on the go? What if we told you that we have the full set for all of your hair needs with some added fun? Oribe’s Travel Essentials Set comes with Gold Lust Repair & Restore Shampoo and Conditioner, Gold Lust Dry Shampoo, Balmessence Lip Treatment, and Côte d’Azur Fragrance roller ball. This grab and go set is good for those on the go business women that don’t want to haul around all of their normal sized hair products, but don’t want to use hotel shampoo and conditioners. It comes with its own Oribe travel bag that has plenty of room for other toiletries and necessities. This on the go set of a $124 value is listed as $98 for this awesome deal. Are you not one to wash your hair often? Then Oribe’s Dry Styling Set is for you. Equipped with Dry Texturing Spray and Gold Lust Dry Shampoo, you could call this the “dirty hair pack”. This holiday pack is perfect when you want to go a week without actually washing your hair when you need to absorb your natural hair oils, adding texture throughout the week, and giving your hair that perfect messy look. The holiday price for this set is $75, usually $90. It is time to treat yourself with Oribe’s Côte d’Azur Body Collection; we call it the “spa set”. This set comes with Oribe’s Côte d’Azur Replenishing Body Wash, Fragrance roller ball, and Restorative Body Crème. There are no hair products in this kit; it is all about self-love and treating yourself well. These are moisturizing products that cleanse impurities within the pores, adds silky softness, rejuvenates skin, and protects against dryness and skin damage. 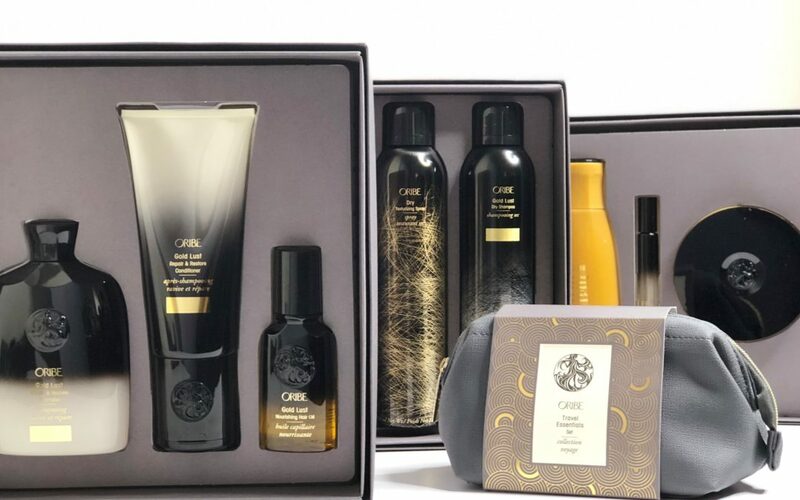 Oribe’s Spa Set Holiday Pack is usually $139, and is listed as $110 for the holiday season. Oribe’s products use natural ingredients for a natural look to your hair. Even non-hair products such as the Balmessence, use natural ingredients like bee’s wax, to act as a lip plumper. Oribe’s products are created by hair stylists, for hair stylists, and are designed to give you head turning hair, smooth and soft skin, and bring out your natural beauty.